Tomato Anchovy Butter . . . There are some fine cooks in our family. Some very fine cooks indeed. And some culinary experts who make a habit of investigating foods, tasting dishes at many and far reaching restaurants, painstakingly adopting their particular butcher shop, buying fresh produce at only the right time of year, etc. And then there are the ones like my little cousin down Louisville way who goes so far as to make her own bacon and more. And I have to say, she knows food. If you need any more convincing, try this recipe. It is pasta perfection in a bowl. And you might want ot have a fresh Calabrese roll or a length of Ciabatta and some coolish butter on hand when you do. And some good Italian red wine for sure. 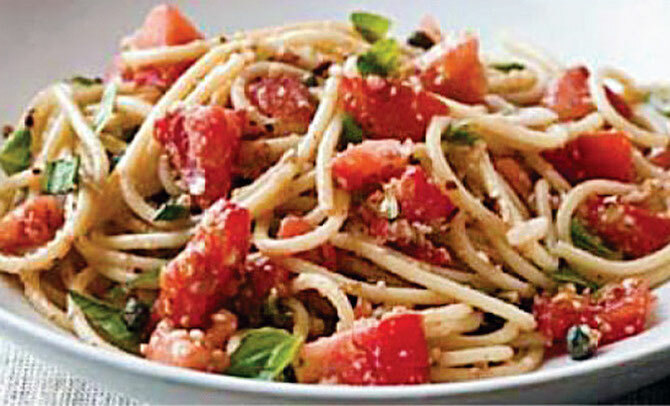 Cook 1/2 pound spaghetti: drain, reserving 1/2 cup liquid. Meanwhile, heat 4 Tbsp. unsalted butter in a large skillet over medium heat. Add 2 anchovy filets and 4 sliced garlic cloves, stirring often, until anchovies are broken down and garlic is soft, about 4 minutes. Add 2 lbs. quartered medium tomatoes; season with salt and pepper and cook, stirring occasionally, until falling apart, 8-10 minutes. Toss in pasta and cooking liquid; cook until sauce coats pasta, about 2 minutes. Toss in chopped herbs (Italian parsley, tarragon, and/or chives).